Some of Canada's most dangerous work is performed in remote and isolated locations. When an accident happens and the clock is ticking on someone's life, a CIP professional will assess and treat the injured worker on the spot and coordinate rapid transport via ground or air to the appropriate hospital. Potential tragedy is avoided and your valued worker's illness or trauma is reduced -- as is recovery time. Operational shutdown time is minimized all because you've made the best decision by hiring CIP as your onsite emergency services provider. 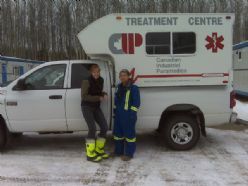 Canadian Industrial Paramedics provides immediate onsite emergency services to the oil and gas, construction, and other industrial sectors exceeding all regulatory standards in British Columbia, Alberta, and Saskatchewan. Our managers have over 150 years of experience providing emergency medical service and over 135 years combined experience in the oil and gas industry. 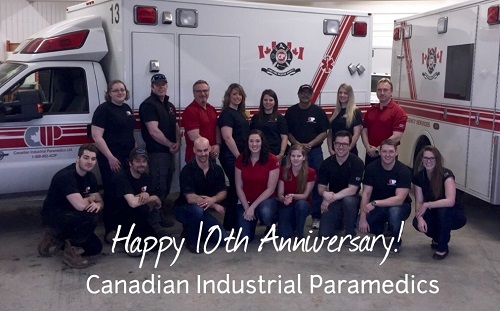 Canadian Industrial Paramedics is proud to celebrate 10 years! Canadian Industrial Paramedics is very proud to be a part of International SOS (Intl.SOS). This merger provides an opportunity for both companies to work as one company and offer a complete solution for all remote project needs in the oil and gas, construction, pipeline, and mining sectors. We now can provide first aiders, EMTs, firefighters, rescue personnel and equipment, paramedics, RNs, RNPs, physicians, pharmacists, physiotherapists, and massage therapists to any jobsite anywhere in North America. Bringing CIP and Intl. SOS together provides our clients with the highest quality Emergency/Health and Safety solution in North America. Canadian Health and Safety Training Ltd.
CHST is committed to providing educational and employment opportunities in the field of emergency medicine and safety programs to Alberta Aboriginal and general public throughout Alberta. CHST's priority is to provide training to prepare Aboriginals from all over Alberta for immediate employment within the petroleum, construction, and other industries.